When I was new to bird watching, I spent winter waiting for spring. Too cold for any interesting birds to be around, right? Well, turns out I was missing a lot. In the backyard and out in the field, there’s a lot to see (and hear) this time of year. It’s a great season for owls, in particular. Last month I received a most welcome 1:45 a.m. wake-up call from a great horned owl. Winter is when this species is most vocal so you may want to leave your window open a crack. You might even hear an eastern screech owl, which, like the great horned, lives here year-round. Other kinds of owls are just visiting. I’ll never forget a December bird outing in 1998 when, near the end of a long cold day, our group leader took us to Pratts Wayne Woods in Bartlett to search for short-eared owls, an endangered species in Illinois. Sure enough, as if on cue, the owls started flying around just before dusk. Less than two months later, at Morton Arboretum, I was thrilled to see my first Northern saw-whet owl. Amazingly, that same February day at the Arb, birders located a Townsend’s solitaire, a Western species very rarely seen around here. Indeed, a few rare birds seem to turn up every winter. Just last month, in fact, local birders spotted two more Western rarities—a varied thrush at Calumet Park and a lark bunting at West Aurora Forest Preserve. My schedule didn’t allow me to try for the thrush, and my one attempt to see the bunting was unsuccessful. My luck was better last January when I caught a fleeting glimpse of a spotted towhee that turned up in Winfield. It wasn’t the prolonged view one hopes for when seeing a species for the first time, but at least I saw the bird. Of course, there are a number of cold-weather “specialties” that occur here every year. Besides the owls already mentioned, some of the most coveted winter visitors are rough-legged hawk, snowy owl, northern shrike, Lapland longspur, snow bunting, common redpoll and white-winged crossbill. Find two or three of these species and you’ve had a good winter. If you bird watch from the kitchen window, look for uncommon winter species that may join your regular feeder birds—pine siskins, purple finches and redpolls, for example. It’s also fun to spot familiar birds that are generally scarce in winter, like robins, flickers and white-throated sparrows. Even a catbird or hermit thrush could make a surprise appearance. One of my backyard highlights of 2004 was the yellow-rumped warbler that visited our heated birdbath on January 6. Yellow-rumps are fairly common in the spring and fall, and a few of them are known to spend the winter here. Still, it was a shock to see one on that cold, snowy day. It was also a reminder of why I love this hobby—the element of surprise. During any month of the year, day or night, you just never know. 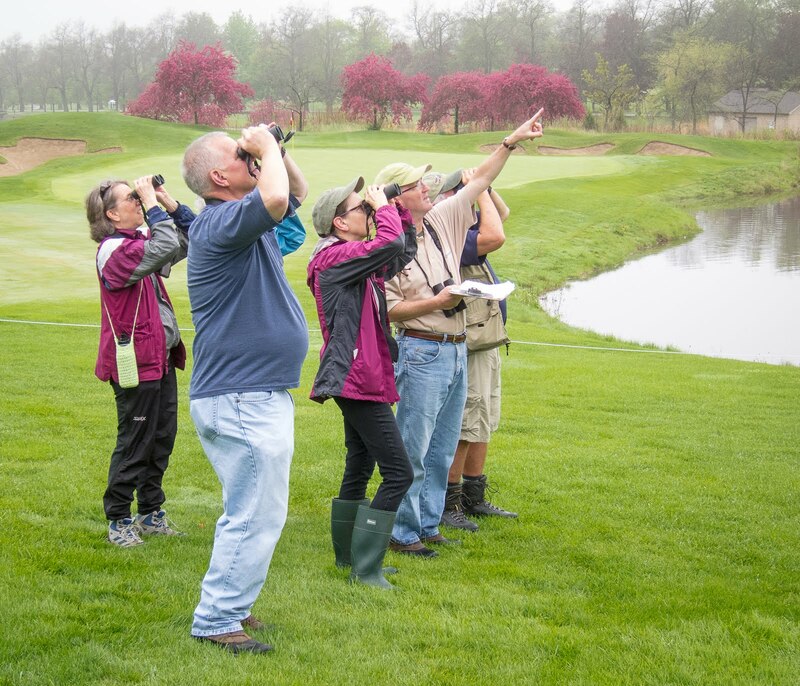 Reiter is a Glen Ellyn, Illinois, resident who enjoys birding at home and in the field. He can be reached at jreiter@wordsonbirds.com.